Autumn 2018 in Italy has been a season full of initiatives putting forestry and agroforestry on the spot. There was a national conference in Turin, a workshop in Tuscany and a national event in Rome. Discussions in the morning focused mainly on the the EC publication on “A Sustainable Bioeconomy for Europe: Strengthening the connection between economy, society and the environment” and on the draft CAP Strategic Plan Regulation. 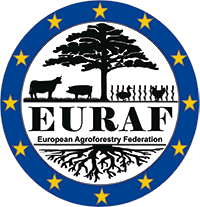 EURAF representatives had the chance to hear from DG AGRI members recent updates on the new CAP proposals and measures and discuss its affectation to the environment and the climate change together with members of other 32 entities. It is the first Italian site to receive the important recognition. Several important technical and cultural aspects contributed to this recognition, including the fact that this area has been essentially an agroforestry system where olive orchards were grazed and/or intercropped, thus providing many ecosystem services. It is just a few clicks and, most of the times, three or four paragraphs are enough to keep our website alive and interesting, updated with information that we all would like to know as agroforesters. From farmers, policy, research, please share your activitity. EURAF President Patrick Worms discusses looming agricultural challenges and appeals to millenials: “regenerative agriculture is the new black". Daniel Inurreta will publicly defend his phD on november 29th. The new CAP is currently being intensively debated and negotiated in Brussels and there is a chance to participate in the debate. Four different agroforestry systems were tested - Portuguese Montado, Cherry tree pastures in Switzerland, Silvoarable systems in the UK and Short rotation coppice in Germany. The Agroforestry session, organised by AFINET partners and EURAF members Jo Smith (ORC), Anastasia Pantera (TEI), Gerardo Moreno (UNEX) and João Palma (ISA), provided a tour of agroforestry systems from Greece to Russia to Cuba to Argentina. For the first time in Europe: the World Congress on Agroforestry! Submit your abstract here by 31th October 2018 and come wow your colleagues next May! Joana Amaral Paulo, delegate for Portugal of the EURAF, offered an oral presentation at the largest Portuguese conference related to the Agricultural sector. They look forward to a fruitful partnership with other members and delegates contributing to the further development of agroforestry in both Ireland and Europe. Cranfield University is looking for a researcher with a PhD (or near completion) focused on grassland or crop management and/or the application of agricultural computer model. The deadline for applications is 15th October 2018. A sandwich PhD study of four years, including an allowance (1190 €/month) for 18 months in Wageningen with health insurance cover for the whole four year period. Bench and University fees will also be covered. As part of the sandwich PhD, you have to broaden your knowledge as specified in a Training and Supervision Plan, including refresher courses, advanced PhD courses, presentation of posters and talks at conferences. The EIP-AGRI Focus Group is looking for 20 experts. Farmers and advisers, researchers and other experts are invited to apply for participation.